"Nerd: A computer expert by aptitude and not mere training. Usually male, under the age of 35 and socially inept; a person whose tremendous skill with operating or designing computer hardware or software is exceeded only by his, rarely her, passionate love of the technology. See also hacker." This post is a dedication to my husband Marcos. Yesterday he expressed some discomfort with his feeling that he's a nerd, which surprised me because I think he's so great the way he is, nerdy or not. So maybe he knows a lot about computers, and maybe his passionate daily updates about the status of the Palm Prix are kind of nerdy, but he is gorgeous, smart, out-going and adventurous, kind and helpful as all heck, and VERY far from socially inept. I wouldn't have him any other way. 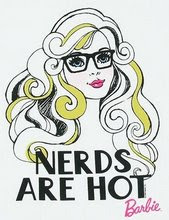 So to help him have pride in his nerdiness, I present to you "Nerds are hot!". (I did not fabricate this image, but I wish I had. Isn't it great?). The following blurb by Kathy Bailey has been sitting above the desk of my friend Rebecca, and after reading it for a few weeks I thought this would be the perfect time to share. High-School girls, be nice to nerds. They age very well. The baby fat disappears; the gawkiness softens. Social skills and a sense of style catch up. New eyewear is purchased. The lessons of suffering transmute into sensitivity and an attractively strong sense of self. And nerds make lots more money than the hunky high-school studs, who peaked at 17 and by the age of 30 are saddled with wounded egos, child support, drinking problems and all the wrong values. Give me a man who reads". Nerd has so many connotations. Marcos is a computer expert, but not in the slightest bit like the negative connotations that come with the term. He is kind, wise beyond his age, has great social skills and was lucky enough to marry you. Is that nerdy??? I call it being blessed with good karma.